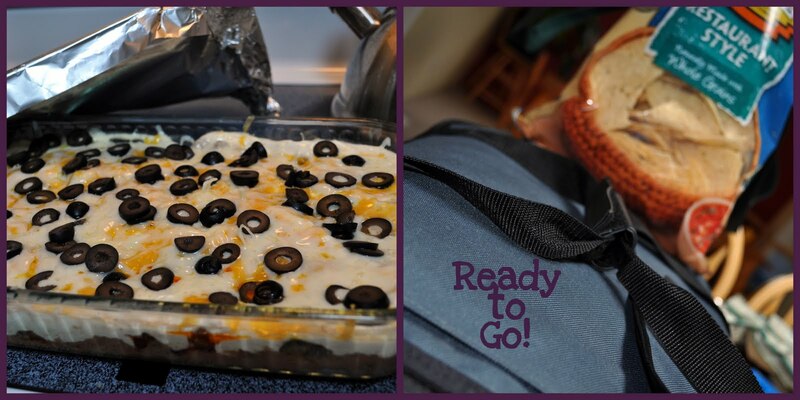 If you’re in the market for a new BBQ/pot-luck/football game friendly crowd-pleasing appetizer you have come to the right place! 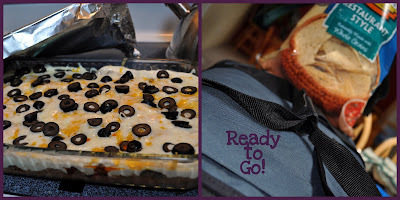 My mother in law is pretty much famous for this Mexican Dip and is pretty much shunned if she doesn’t bring two pans of it to the annual 4th of July Bash we attend every year. It’s that good. She shared the recipe with me a few years ago, and ever since Andy and I have been taking it to pretty much any BBQ we attend! Now, before I go sharing this recipe, you have to promise me one thing…just because you have this little piece of awesome, you still have to invite us over for BBQ’s. Deal? Seriously…not joking. Andy wanted me to make sure and point this out. Ok? Officially, we have no idea what the name of it is. 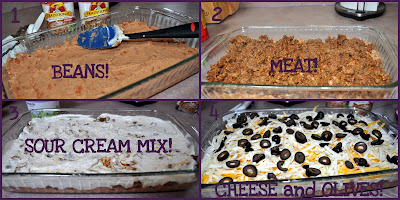 Unofficially, we call it “Mom’s Mexican Dip”. Seriously…try it. You will love it. And you will thank me. 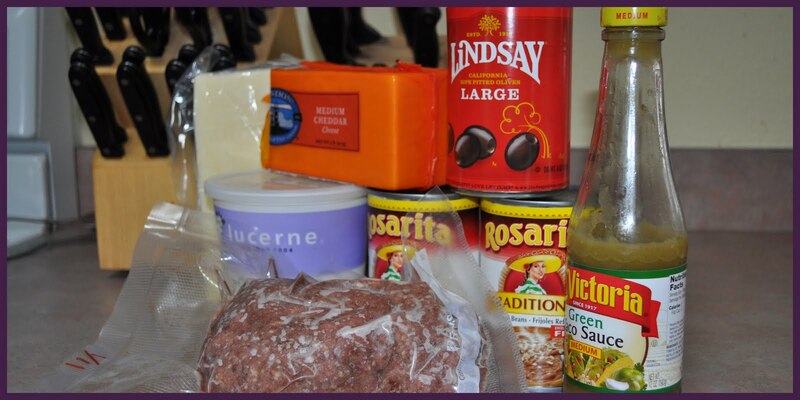 Brown ground beef, and prepare as instructed on taco seasoning packet. While the meat is cooking, spread beans in the bottom of a 9×13 pan. In a medium bowl, mix together sour cream and taco sauce. Once meat is ready, spread evenly over the top of the beans. After that, spread the sour cream mix. Then top GENEROUSLY with cheese. Seriously…error on the side of A LOT. Sprinkle with sliced olives. Cover with aluminum foil (remember to spray the foil w/ non-stick spray!). Bake at 350 for 20 minutes. Serve with tortilla chips and enjoy. BOOM. Ok it’s your turn…what’s your favorite go-to dish for BBQs? This entry was posted in BBQ, food, party, Recipes, SUNSHINE and tagged dip recipe, hot dip, hot dip recipe, mexican dip, mexican dip recipe, tailgater dip on June 1, 2011 by katherine. 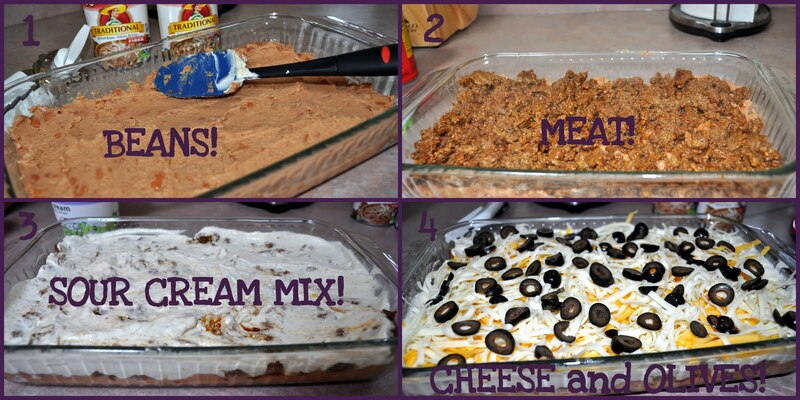 You can't go wrong with Mexican dip! It's ALWAYS a crowd-pleaser! We make something like that! We always called it "Seven-Layer Dip" — even when it didn't have exactly seven layers. SO yummy. Pingback: Steppin’ Out ~ Fun Weekend!